Lower Courthouse Wash is a backcountry trail located in Arches National Park near Moab, Utah. 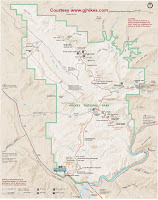 Hikers can begin at either the trailhead within the heart of the park at Courthouse Wash or at the Moab Canyon trailhead at the south end of the trail. Since there isn't an entrance station to pass through at the Moab end of the trail there won't be a fee to pay. The Courthouse Wash trail is very primitive and probably hasn't changed much since ancient times when Native Americans lived here. Also, even though the trail is in Arches National Park there aren't any natural arches to see on this hike. There are a few in the upper area of Courthouse Wash but that is another hike. 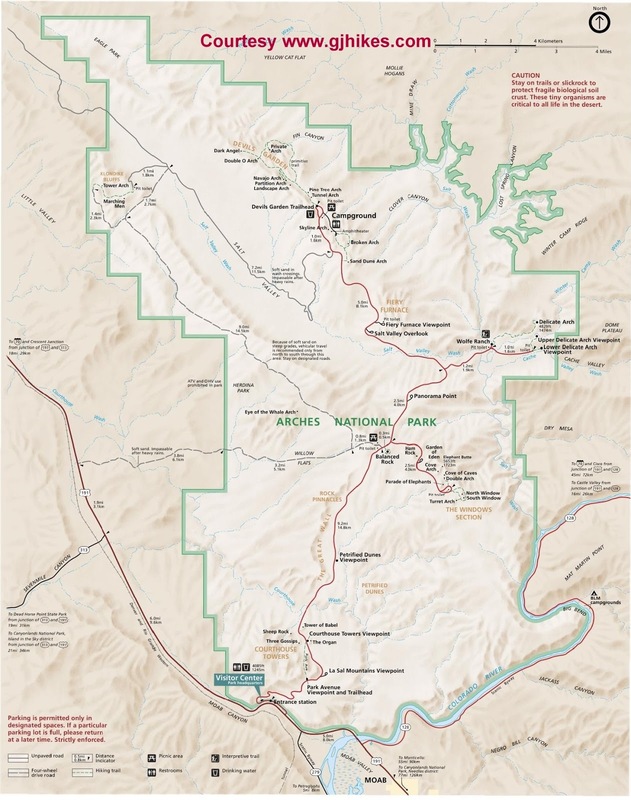 The parking area and trailhead is located where the Arches Scenic Drive crosses Courthouse Wash about 4.5 miles inside of the park. Cross the road at the crosswalk to find the faint primitive trail to begin the hike. Follow the trail a short distance and it will drop into Courthouse Wash. This part of the wash has shallow walls with lots of trees, willows and brush to navigate through. In a few places the best route isn't very obvious but usually there is a good path like the one in the picture. The crux of the hike is the stream that runs through the canyon. It has to be crossed about a dozen times. In some areas it is as wide as it looks in this picture while in others it is more narrow and easy to step across. We were able to find places where we could cross without getting our feet wet but it took a little exploring at times. A pair of trekking poles would have come in handy but we had left them in the truck. The wash is only shallow for about half of a mile before it becomes more of a canyon with the walls becoming several hundred feet high. At one spot the stream cascades down some benches of slickrock where it forms a into a large pool of water at the bottom. Near the 4 mile point of the hike there is an alcove with a large shield shaped pictograph. Some nerdowell had used it for target practice severely damaging it. We repainted it on the computer to show what it would have looked like originally when the paint was fresh and before it was shot up and filled full of holes. 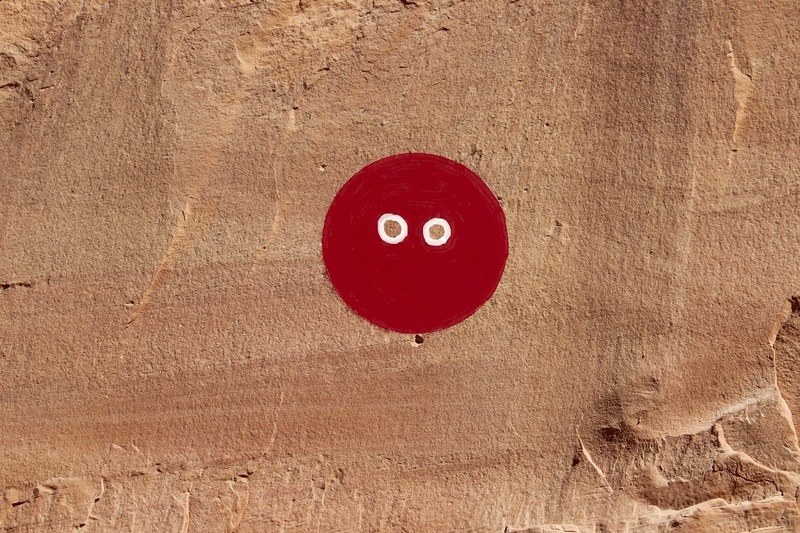 We have seen shield pictographs near the mouths of canyons before that may have been used to warn visitors entering the canyon. This one looks almost spooky. Courthouse Wash could be a pretty appealing family hike during warmer weather. Kids would probably enjoy wading in the stream. A few of the pools are almost big enough to swim in. The sign at the mouth of the wash shows the one-way distance to be 5 miles but it is off by over 1 mile. If you haven't seen it be sure to check out the Courthouse Wash Pictograph Panel near this point. Apparently camping is allowed in Courthouse Wash if you stop at the Visitor Center and obtain a backcountry permit first. The permit is probably free if they operate the same as they do in Canyonlands. I took advantage of a shuttle ride so that I would only have to hike the wash one-way. We had a room at the Marriott that sits across the highway from Courthouse Wash. Surfer girl dropped me off at the other end of the trail and waited for me at the room while I was hiking. Most Courthouse Wash hikers park here at the Moab Canyon trailhead and only hike up the wash a bit before turning around. That is a pretty good option if you don't have a shuttle ride and you don't want to hike over 12 miles round trip. If you would like to see it for yourself then all you have to do is 'Take a hike'.